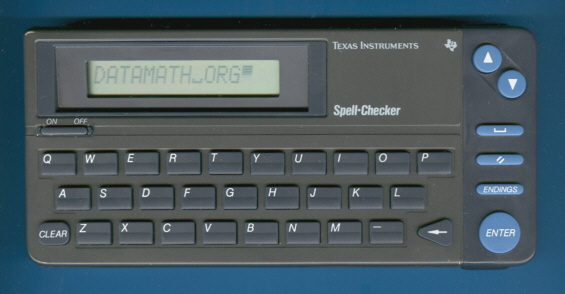 Size: 3.2" x 7.0" x 0.7"
Texas Instruments introduced already in 1989 this powerful Spell-Checker RR-1. The later RR-2 added a Thesaurus to the Spell-Checker function. A much smaller product followed within 1 year, don't miss the PS-3000. What is a Spell-Checker? Type in a word and the Spell-Checker compares it immediately with roughly 97,000 words of its memory. We noticed some minor changes of the key printing during production time. Don;t miss the second edition of the RR-1 and focus on the printing of the [ON - OFF] key legend. Dismantling this early Spell-Checker RR-1 reveals a rather complex printed circuit board (PCB) centered around a Z80 compatible Toshiba T84C00A microprocessor, a Toshiba TC531000 OTP-ROM with 128k Bytes capacity and a small RAM Sanyo LC3518 with 2k Bytes capacity. The single-chip display driver was assembled in reverse direction and hides its type. We assume that the chip was manufactured by Toshiba. © Joerg Woerner, Ocober 23, 2009. No reprints without written permission.